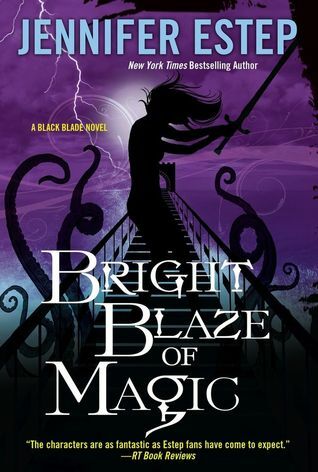 Bright Blaze of Magic is the final book in Jennifer Estep’s Black Blade trilogy. It continues in the same tone as its two predecessors, which means that it’s exciting, entertaining, and very easy to read. I have always admired Estep’s style precisely because it’s so easy to absorb. Her writing is as far from frilly as you can get – it is, I dare say, functional – but it serves her well and it doesn’t draw attention away from her stories, which is the most important thing. Lila and the Sinclairs face an almost invincible enemy in this finale. Victor Draconi has been collecting magic for years and he’s determined to use it all to destroy Claudia Sinclair and those who work for her. Lila has her own plans to stop him and a mind set on revenge for the murder of her mother, but Victor may prove too difficult an adversary even for someone with Lila’s talents and strengths. Bright Blaze is action-packed from start to finish. It begins with theft, as things so usually do when Lila is involved, and continues with a whole series of other excitements. Naturally, the Sinclairs have to lose everything and find themselves pushed into a corner by Victor before they can unite with other families and fight back. Lila is yet again the best person for the job, and with the help of her boyfriend and several trusted friends, she has to make plans and run into danger to save everything and everyone she loves. I adore Estep for giving us a settled and supportive romance between people who truly understand each other. There was absolutely no drama between Lila and Devon, or Felix and Deah for that matter. Both couples were steady and strong and they fought their enemies together, without unnecessary tension. After all, they had more than enough enemies to fight without turning on each other. I have to give credit where credit is due: Jennifer Estep did an excellent job with this trilogy. While it isn’t the best written or the most memorable series I’ve ever read, it’s still one of the most entertaining and sometimes, that’s pretty much all I need. Yes I couldn't agree more, especially with that last paragraph, it fits this series perfectly. I know this author's name sounds familiar but I know I haven't read anything of hers. Im off to look her up so I can remember what she's written. I think this series sounds great! Oh yes I had a really great time with this series and with this book! I plan to read this now that all three are out. I'm always surprised to learn a series ender when I've not even heard of a series. Especially from an author like Ms. Estep. This one has been receiving so much love as of late! So the question is, where have I been? Lol. I've heard a lot about Estep and have been meaning to pick up her books for awhile now so I hope I can get around to this trilogy this summer since it's a lot less intimidating than her other UF series. Lovely review, Maja--glad this one didn't disappoint!